We’re on the same team as our clients, working to surpass their project goals every day. That shoulder-to-shoulder approach yields incredible results. 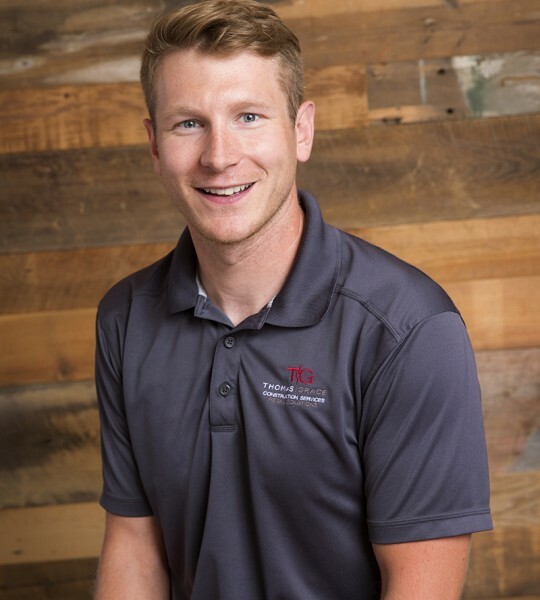 Thomas-Grace has been my work home since 2012, but I have nearly 15 years of industry experience, starting out as a carpenter while studying at Minnesota State University–Mankato where I earned a B.S. in Construction Management/Facilities Planning. A tenant-improvement project in a San Francisco high-rise required constant partnership between the trades, landlord and surrounding tenants — not to mention some unusual challenges presented by special engineering for seismic and fire suppression. It was incredibly rewarding to see the project turn over on time. No day is the same, and I thrive on figuring out solutions to challenges. Plus, I don’t have to climb stairs to get to my desk. In the winter I ski and icefish; in the summer I race bikes and relax in the wilderness of northern Wisconsin.